Celebrate Halloween with a ghoulish dinner. Scare your guests with some Halloween party foods and other freighting treats. Start your ghostly dinner with some eerie appetizers. 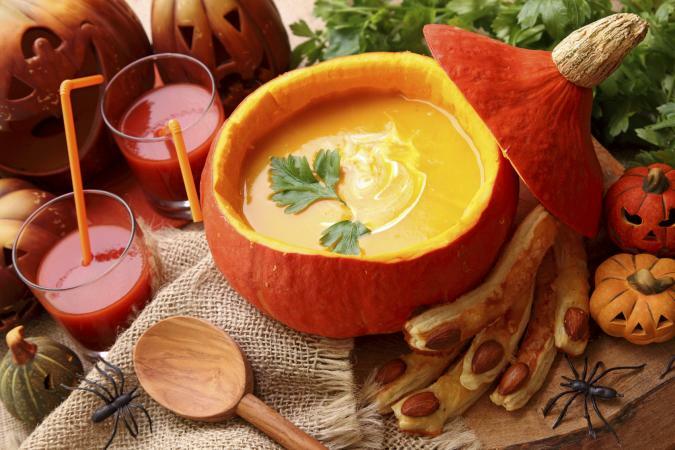 This yummy pumpkin soup is perfect for Halloween. This recipe serves 6 - 8 guests and can be modified to accommodate a larger or smaller crowd. Heat chicken stock, salt, pumpkin puree, onion, garlic, pepper and butter. Bring to a boil, reduce heat to low, and simmer for 30 minutes uncovered. Reduce heat to low, and simmer for another 30 minutes, uncovered. Pour into soup bowls and garnish with fresh parsley. Consider serving more than one of these tasty starters. Brains on crackers - Combine cooked shrimp with mayonnaise or a similar dressing to create the brains that sit atop the cracker. Mummy sausages - Use pastry sheets and tiny hot dogs or sausages to create these mummy sausages. Deviled eggs - The only thing devilish about this treat is its name. Serve this party favorite with the perfect Halloween themed name. Whether you are hosting a buffet or sit-down dinner, a main course is a primary part of the meal. 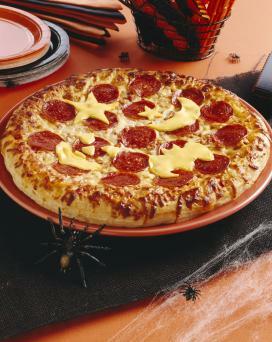 Get the bats out of the belfry and onto your pizza along with other Halloween themed toppers. This recipe serves 4 - 6 people. Roll one batch of the pizza dough or refrigerated crust flat. Use bat shaped cookie cutters to cut out bats or choose other Halloween themed cookie cutters to create those shapes. Bake the bats and other shapes on a greased cookie sheet for 10 minutes at 350 degrees. Mix the tomato sauce, pizza seasoning, garlic, onion, salt, and pepper together. Put some pepperoni slices on top of sauce. Mix all of the cheese together in a bowl. Sprinkle 1/2 of the cheese mixture on top of the pepperoni. Put the rest of the pepperoni on top. Bake at 400 degrees for 20 minutes or until light brown. Place baked bats on top of pizza and serve. Spaghetti is a popular dish for both adults and children. This dish will surely put a smile on guests' faces when they see these funny jack-o-lanterns smiling back at them. This dish will serve 6 - 8 people. Carve each bell pepper into a jack-o-lantern. Simply cut the top off of the peppers and retain the top with stem. Hollow out the interior of the pepper and carve a jack-o-lantern face with a sharp knife. Cook and drain the spaghetti according to directions on the package. Mix the sauce with the pasta. Spoon a few scoops of the pasta into each individual carved pepper. 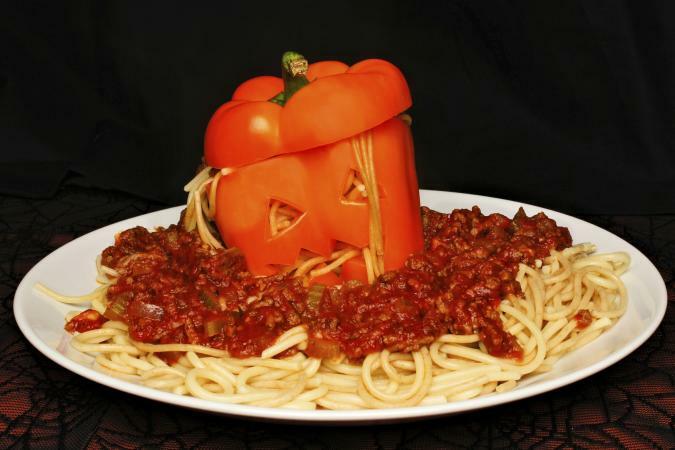 Make sure the spaghetti 'oozes' out the eyes and mouth of the jack-o-lantern for a "scary" look. Replace the top of each pepper and serve on top of a plate of pasta and sauce. Slow cooker beef stew - Beef, carrots, red potatoes, and Guinness beer combine to create something sure to please your dinner guests. Serve it in a hollowed out pumpkin for a truly spooktacular dish. 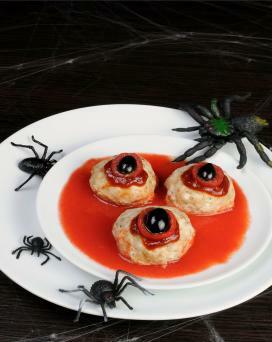 Meatball mummies - Spook your dinner guests with these scary meatball mummies. You can use hot dogs instead of meatballs if you and your guests prefer. Pair your favorite dinner with a yummy and slightly horrifying side dish. This is a simple but healthy dish for a Halloween meal. Plan to make one per person expected, plus a few extra. 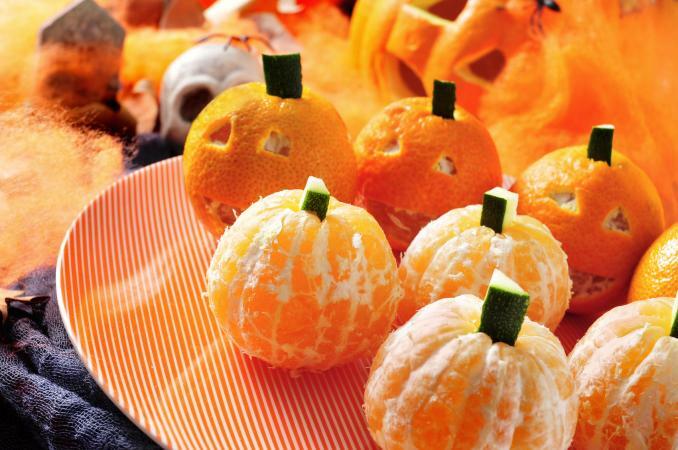 Use a small knife to create a jack-o-lantern face on the peel of some of the mandarin oranges. Try to only remove the peel and leave the orange inside untouched. Make a small cut on the top of the mandarin oranges and insert the stems. You can even remove some of the peels and just insert a stem on the top. This is easier for younger guests who may not be able to peel their own orange. Chicken meatballs are the perfect side-dish to go with spaghetti, pizza, or any pasta dish. This recipe is sure to make your dinner guests squirm. It will serve about 6 to 8 people, depending on size of meatballs and number served on the side. Place ground chicken, garlic, onions, basil, tomato paste, salt, pepper, and cheese into a mixing bowl and combine. Shape mixture into evenly sized meatballs that are about an inch in diameter. Bake the meatballs in the oven at 425 F for 15 - 20 minutes or until they are cooked and brown. Remove the meatballs from the oven and cool. Add a small spoon of tomato sauce on top of each meatball. Add a slice of tomato to the top of each meatball. Put a slice of black olive to the top of each tomato slice to create the look of eyeballs. Secure toppings with toothpicks if necessary. Warm the meatballs in the oven and serve warm. Frog eye salad - This fruity salad is refreshing to eat but might freak out your guests when they see it staring back at them. Nacho chips - Make your own guacamole and serve it with chips. To give your table a festive look, carve a jack-o-lantern and arrange so the guacamole appears to be coming out of the face's mouth to simulate vomit. Brain mold - Make layered Jello in a brain mold for a creepy, but delicious side-dish. Consider using a red gelatin for a super creepy look. Serve Halloween inspired drinks to go with your spooky meal. Hot chocolate - Warm tummies with yummy hot chocolate on a crisp fall night. 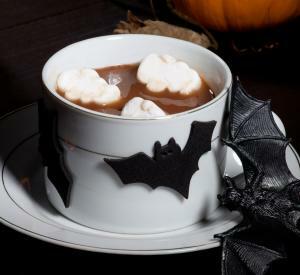 Consider serving this treat in a Halloween themed mug. Rusty nail - This adult beverage with a scary name is made of Scotch whiskey. This drink can be garnished with a lemon slice or consider using an orange slice to match the traditional Halloween color scheme of orange and black. Halloween punch - This easy party punch recipe will delight both kids and adults. Use caution when dealing with dry ice. Finish your Halloween meal with a frightening treat. 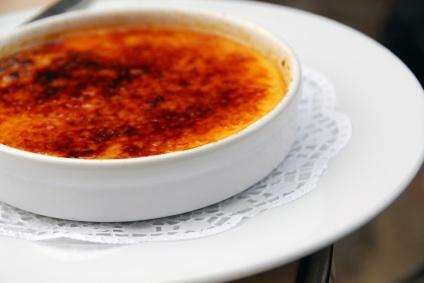 Pumpkin crème brûlée - Continue the pumpkin theme into dessert with this tasty crème brûlée. This dessert will satisfy every taste bud, even your most sophisticated guest. Haunted Halloween house cake - This dessert is not only a tasty treat, but makes for a fun centerpiece for your party. This cake is best reserved for the hostess who has a few days to prepare for the party. Halloween dirt cake - This cake is quick and easy and the perfect way to end a perfectly spooky meal. This dessert can be made quickly and is a good solution for those on a tight time schedule. Enhance your Halloween dinner with fun table decorations. A jack-o-lantern with a battery operated candle is a perfect centerpiece. Also consider using trick-or-treat pails filled with candies on your table or simply scatter pretty fall leaves on the table. These finishing touches enhance your dinner menu.